XYIENCE® has released XYIENCE Protein Bars, the first such products to contain Sustamine® L-Alanyl-L-Glutamine. The non-GMO, gluten-free XYIENCE Protein Bars are designed to fuel the body with the cleanest ingredients to provide sustained energy during workouts. They contain 20g of Protein with only 1 gram of Sugar, sweetened with Stevia and are soy free containing 15-17g Fiber made with Quinoa and Amaranth and also with Sustamine, a dipeptide of 2 amino acids that help the body with Hydration and sustaining physical performance! Sustamine® L-Alanyl-L-Glutamine, a dipeptide of glutamine, provides several substantial benefits such as enhanced recovery, immune system support, and performance. On top of these benefits, research suggests that Sustamine® is absorbed more than 200 percent better than standard L-glutamine. 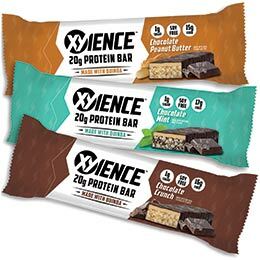 XYIENCE Protein Bars come in three great tasting flavors: Chocolate Peanut Butter, Chocolate Mint and Chocolate Crunch. For more information and to purchase online, click here. Launched in 2006 and now headquartered in Austin, Texas, XYIENCE is the original zero calorie energy beverage with all natural flavors and colors. XYIENCE is available in eight exclusively zero calorie flavors: Cherry Lime, Mango Guava, Frostberry Blast, Blue Pomegranate, Cran Razz, Fruit Punch, Tangerine and Melon Mayhem. XYIENCE is marketed strictly to consumers ages 18 and over. XYIENCE was acquired by Big Red, Inc. in 2014. Find more info about XYIENCE online at XYIENCE.com or at a retailer near you. XYIENCE® is a registered trademark by XYIENCE BEVERAGE COMPANY, LLC, in AUSTIN, TX, 78730. Sustamine® L-Alanyl-L-Glutamine, manufactured by Kyowa Hakko Bio Co., Ltd., is a clinically studied and patented form of L-Alanyl-L-Glutamine. Sustamine is a stable dipeptide of L-Alanine and L-Glutamine and is more easily absorbed by the body than complex protein molecules. This makes Sustamine a highly effective ingredient for hydration, endurance and recovery. * Sustamine is manufactured through a patented fermentation process to yield high quality and high purity. Vegetarian, allergen-free and the only GRAS L-Alanyl-L-Glutamine, Sustamine is also tasteless, odorless, and stable in liquids. For more information on Sustamine, visit: Sustamine.com.